The journey began at the end of July 2017 when Joslynn Mayhew’s mother, Jodi, noticed her 10-year-old daughter was not eating as much as usual. “I just thought it was a normal young girl starting to worry about her weight,” she said. But after a few days of Joslynn complaining of discomfort in her side, Jodi took her to a local clinic. Her appendix checked out okay, but she tested positive for strep throat, which can sometimes cause stomach pain. Over the next ten days, she was on a regimen of antibiotics, but her side continued to ache, and she lost interest in the things she enjoyed because she simply did not feel good. Her family took her to the emergency room for further testing to try to get to the bottom of the little girl’s distress. A CT scan confirmed the worst possible news. 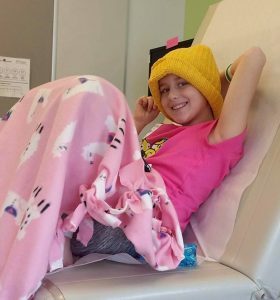 A large mass covered 50 percent of her liver, and she was immediately sent to Nationwide Children’s Hospital in Columbus, Ohio where she was admitted for more tests, including a liver biopsy. The initial results indicated the mass was indeed cancer, and her specialists wanted her to start treatment right away. Chemo was very difficult and made her extremely sick. This improved with medication, which also caused her to sleep most of the time. After several rounds, the doctors adjusted her meds, and thankfully this helped her to feel better. When the fourth-grader began to lose her hair, it was time to shave her head. But her mother let her shave her head first. 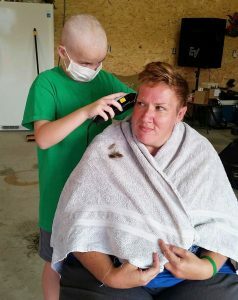 Her father and stepfather followed suit, and even some of her neighbors, school friends, and the school nurse and some of her family shaved their heads as well to show their support. Jodi’s employer, Ageless Aesthetics, hosted a benefit walk for the family at Ashland Central Park with live music, food, a photo booth, bounce house, and silent auction. Sciotoville East Schools, where Joslynn attends, hosted a benefit with a vendor fair, talent show, silent auction, and concession stand. Both events raised money to help the family with travel expenses. 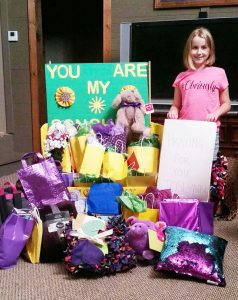 Her home church, Rubyville Community, gave her a “Sonshine Box” filled with toys, coloring books, and crafts to help her stay busy at doctor’s appointments and during treatments. The box also contained gift cards to help the family with meals. These were just a few of the donations she received. The family was comforted that their hometown had joined them on this journey, but little did they know the most difficult part of this season was looming in the shadows. 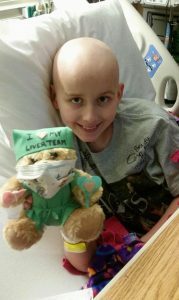 Joslynn’s oncologist asked her to consult with the liver transplant team at Cincinnati Children’s. The family believed the doctors there would give clear answers on what course of treatment to take, but they left the appointment feeling confused and lost as they were given the choice between a liver transplant or a resection. “We wanted to hear that the transplant was the way to go, not that we had two options and we needed to choose. They were the doctors. They should be telling us what the best thing was. So, after some time and talking with the doctors in Columbus, we decided on the transplant. We were at Columbus getting ready to start Cycle Four of chemo when we got the call that they had a liver that would be a perfect match to Jos. 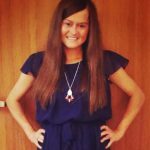 Only two weeks on the transplant list,” Jodi explained. All along the way, God had His hand on her, and during her surgery was no exception. Her 10-hour operation went well with no complications. 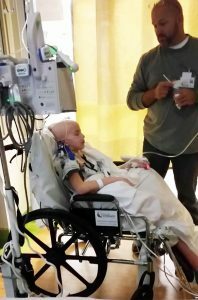 In fact, Joslynn only spent two days recovering in the Intensive Care Unit instead of the minimum five days. Today, Joslynn is making huge strides in getting back to the active lifestyle she had before her horrible nightmare began, such as playing outside with her friends and playing basketball. “Things are much better now, and she is back in school and spending time with her friends and family and getting back to a new normal. It’s like nothing ever happened,” Jodi shared. This is the best possible outcome in a situation like this. 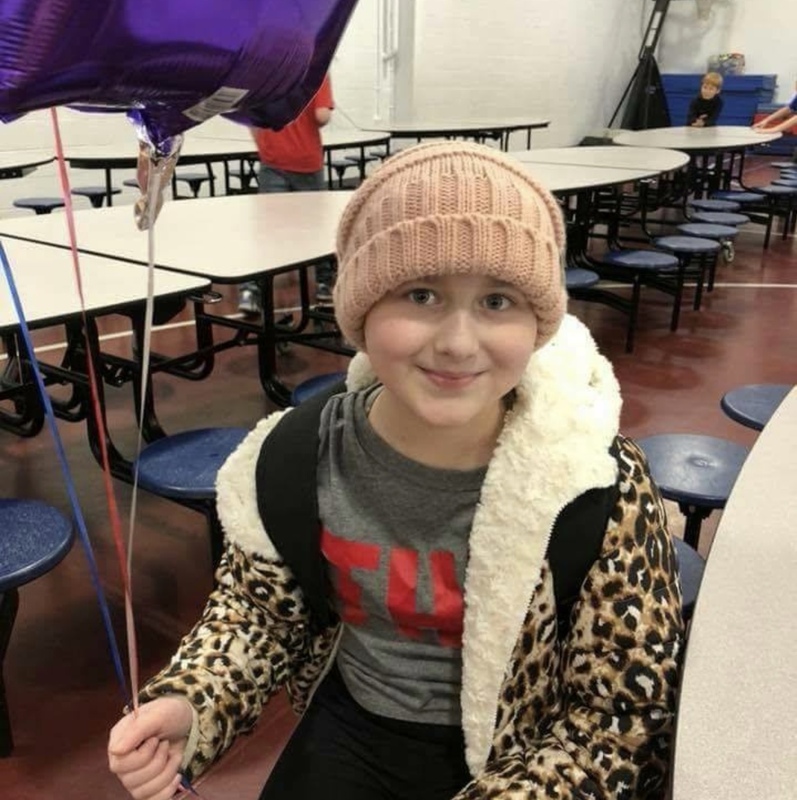 We will never know why things like this happen until we get to Heaven, but it is great to know that miracles still happen in Southern Ohio, hope is never void, and community unity is still possible all through the journey of a little girl— Joslynn’s Journey. Whitney Ward graduated from Asbury University with a Bachelor of Arts in Creative Writing and a minor in Journalism. During her junior of college, she served on the University’s newspaper staff as the Assistant Sports Editor and Contributing Sports Writer. Upon graduating from Asbury, she wrote for GO InterNational, a mission organization located in Wilmore, Ky., and she served on Rubyville Community Church youth camp’s newspaper staff. She has shared the unique story of God’s miraculous touch on her life with numerous audiences at churches and schools as well as on mission trips. Whitney resides in Rubyville, Ohio and attends Rubyville Community Church where she teaches first and second graders in Sunday School and manages the church’s website.